With the focus on the learner, the learning process and learning outcomes, these key reference instruments of the Council of Europe have contributed to better quality language education across Europe and beyond. The Common European Framework of Reference for Languages: Learning, teaching, assessment (CEFR) is exactly what its title says it is: a framework of reference. It was designed to provide a transparent, coherent and comprehensive basis for the elaboration of language syllabuses and curriculum guidelines, the design of teaching and learning materials, and the assessment of foreign language proficiency. It is used in Europe but also in other continents and is now available in 40 languages. The CEFR describes foreign language proficiency at six levels: A1 and A2, B1 and B2, C1 and C2. It also defines three ‘plus’ levels (A2+, B1+, B2+). Based on empirical research and widespread consultation, this scheme makes it possible to compare tests and examinations across languages and national boundaries. It also provides a basis for recognising language qualifications and thus facilitating educational and occupational mobility. But the CEFR is much more than its proficiency scales: these scales are accompanied by a detailed analysis of communicative contexts, themes, tasks and purposes as well as scaled descriptions of the competences on which we draw when we communicate. The CEFR does not offer ready-made solutions but must always be adapted to the requirements of particular contexts, for example, the teaching and learning of Romani and of French Sign Language. The European Language Portfolio (ELP) is a document in which those who are learning or have learned one or more languages can record and reflect on their language learning and intercultural experiences. It is designed to mediate to learners, teachers and schools, and other stakeholders the ethos that underpins the CEFR: respect for linguistic and cultural diversity, mutual understanding beyond national, institutional and social boundaries, the promotion of plurilingual and intercultural education, and the development of the autonomy of the individual citizen. The ECML hosts a dedicated website for the ELP to promote the pedagogical benefits of this instrument and to facilitate its use in practice. The ELP has three components: a language passport, a language biography, and a dossier. The Language Passport provides an overview of the individual’s proficiency in different languages at a given point in time. It is expected that the learner will update the language passport at regular intervals, to reflect progress in language learning and the acquisition of new intercultural experiences. It will also normally include the Self-assessment Grid from the CEFR. The Language Biography contains goal-setting and self-assessment checklists that expand on the summary descriptors contained in the Self-assessment Grid. It encourages the learner to state what he/she can do in each language and to include information on linguistic, cultural and learning experiences gained in and outside formal educational contexts. It is organised to promote plurilingualism, i.e. the development of proficiency in a number of languages. The Dossier offers the learner the opportunity to select materials to document and illustrate achievements or experiences recorded in the Language Biography or Passport. to provide a record of the linguistic and cultural skills they have acquired (to be consulted, for example, when they are moving to a higher learning level or seeking employment at home or abroad. Through its projects past and present, its project outputs and resources as well as its training and consultancy, the ECML has significant expertise in supporting teachers and teacher educators to understand the philosophy of learning, teaching and assessment on which these instruments are based, and to ensure their effective and efficient application in different learning contexts. The website contains a wide range of information on how to use the ELP including practical materials like videos, PowerPoint presentations, posters, worksheets as well as links, references and FAQs. 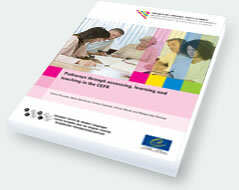 Information on ELP developments within individual European countries is provided with material in national languages. Brian North, co-author of the CEFR, discusses innovative aspects of the framework.